A timeline & history: One year into the engineered "Arab Spring," one step closer to global hegemony. Editor's Note: The title, "Year of the Dupe," was inspired, and indeed coined by Dr. Webster Tarpley of Tarpley.net, who is noted below as giving the initial tip-off regarding Egypt's unrest back in January 2011. It is hardly a speculative theory then, that the uprisings were part of an immense geopolitical campaign conceived in the West and carried out through its proxies with the assistance of disingenuous foundations, organizations, and the stable of NGOs they maintain throughout the world. As we will see, preparations for the "Arab Spring" and the global campaign that is now encroaching on both Russia and China, as predicted in February 2011's "The Middle East & then the World," began not as unrest had already begun, but years before the first "fist" was raised, and within seminar rooms in D.C. and New York, US-funded training facilities in Serbia, and camps held in neighboring countries, not within the Arab World itself. December 3-5, 2008: Egyptian activists from the now infamous April 6 movement were in New York City for the inaugural Alliance of Youth Movements (AYM) summit, also known as Movements.org. There, they received training, networking opportunities, and support from AYM's various corporate and US governmental sponsors, including the US State Department itself. The AYM 2008 summit report (page 3 of .pdf) states that the Under Secretary of State for Public Diplomacy and Public Affairs, James Glassman attended, as did Jared C0hen who sits on the policy planning staff of the Office of the Secretary of State. Six other State Department staff members and advisers would also attend the summit along with an immense list of corporate, media, and institutional representatives. Shortly afterward, April 6 would travel to Serbia to train under US-funded CANVAS, formally the US-funded NGO "Otpor" who helped overthrow the government of Serbia in 2000. Otpor, the New York Times would report, was a "well-oiled movement backed by several million dollars from the United States." After its success it would change its name to CANVAS and begin training activists to be used in other US-backed regime change operations. 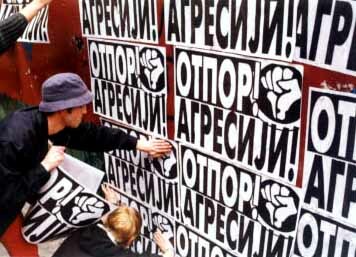 Photo: Serbia's "Otpor," a model for future US-backed color revolutions. Foreign Policy Magazine would report in their article, "Revoluton U," that CANVAS assisted protesters in the "Rose Revolution" of Georgia, the "Orange Revolution" of the Ukraine, and is currently working with networks from Belarus, Myanmar (Burma), all across the Middle East and North Africa, as well as with activists in North Korea, and 50 other countries. 2009: In a US State Department funded Radio Free Europe/Radio Libery (RFE/RL) article titled, "Exporting Nonviolent Revolution, From Eastern Europe to The Middle East," it was stated, "Popovic then exported his nonviolent methods, helping train the activists who spearheaded Georgia's Rose Revolution in 2003 and Ukraine's Orange Revolution in 2004. And now, Popovic is deploying his new organization, called Canvas, even farther afield -- assisting the pro-democracy activists who recently brought down despotic regimes in Egypt and Tunisia." Activists from Iran, Belarus, and North Korea were also confirmed by RFE/RL as having received training from CANVAS. The RFE/RL article places the activists' meeting with CANVAS sometime during 2009. February 2010: The April 6 Movement, after training with CANVAS, would return to Egypt in 2010, along with UN IAEA Chief Mohammed ElBaradei. April 6 members would even be arrested while awaiting for ElBaradei's arrival at Cairo's airport in mid-February. Already, ElBaradei, as early as 2010, announced his intentions of running for president in the 2011 elections. Together with April 6, Wael Ghonim of Google, and a coalition of other opposition parties, ElBaradei assembled his "National Front for Change" and began preparing for the coming "Arab Spring." An April 2011 AFP report would confirm this, when US State Department's Michael Posner stated that the "US government has budgeted $50 million in the last two years to develop new technologies to help activists protect themselves from arrest and prosecution by authoritarian governments." The report went on to explain that the US "organized training sessions for 5,000 activists in different parts of the world. A session held in the Middle East about six weeks ago gathered activists from Tunisia, Egypt, Syria and Lebanon who returned to their countries with the aim of training their colleagues there." Posner would add, "They went back and there's a ripple effect." That ripple effect of course, is the "Arab Spring." January 16, 2011: Al Arabiya News reported in their article, "Tunisian exiled reformist to head back home," that Moncef Marzouki was returning to Tunisia (from Paris) amidst the chaos sown by US State Department trained, supported, and equipped mobs who were "triggered" by the convenient release of US State Department cables via Wikileaks. Quite clearly, considering the training Tunisian opposition groups received long before the cables were released, the Wikileaks cables were merely used as a planned rhetorical justification for long ago premeditated foreign-funded sedition. Since then, Wikileaks has been employed in an identical manner everywhere from Egypt to Libya, and even as far flung as Thailand. Moncef Marzouki, it would turn out, was founder and head of the Arab Commission for Human Rights, a collaborating institution with the US NED World Movement for Democracy (WMD) including for a "Conference on Human Rights Activists in Exile" and a participant in the WMD "third assembly" alongside Marzouki's Tunisian League for Human Rights, sponsored by NED, Soros' Open Society, and USAID. A "call for solidarity" by the International Federation for Human Rights (FIDH) mentions by name each and every group constituting the Tunisian opposition during the "uprising" in January 2011 as "FIDH member organisations." These include Marzouki's "Tunisian League for Human Rights," the "Tunisian Association of Democratic Women," and the "National Council for Liberties in Tunisia," or CNLT. FIDH, acting as an international nexus for various foreign-funded organizations carrying out sedition worldwide under the guise of "human rights," is itself fully funded by the US government through the National Endowment for Democracy, Soros' Open Society, and many others with clearly compromised affiliations. January 28, 2011: After a warning by journalist/activist Dr. Webster Tarpley of World Crisis Radio, the alternative media began looking closer at the unrest in Egypt which began shortly after Tunisia's growing crisis. In "All is not what it seems in Egyptian Clashes," it was noted that protest leader Mohammed ElBaradei was in fact a devoted agent of the West, with a long standing membership within the Wall Street/London funded International Crisis Group (ICG) along side "senior Israeli officials" including the current Israeli President Shimon Peres, the current Governor of the Bank of Israel, Stanley Fischer, and former Israeli Foreign Minister, Shlomo Ben-Ami. The ICG also includes senior American bankers and geopolitical manipulators including George Soros, Zbigniew Brzezinski, Richard Armitage, Samuel Berger, and Wesley Clark. Photo: ElBaradei's ties to the West go much deeper than merely play-acting within the ineffectual, genocide-enabling UN. 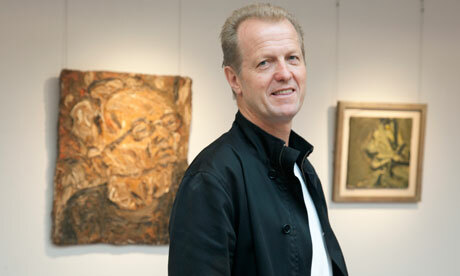 He is also a member of the corporate-financier funded International Crisis Group. The most recent manifestation of this came when Israel farcically called ElBaradei an "Iranian agent." This latest performance further illustrates the immense level of duplicity with which world events are being manipulated. February 17, 2011: The London-based National Front for the Salvation of Libya (NFSL) calls for a Libyan "Day of Rage" to match the US-destabilization rhetoric used in Tunisia and Egypt. The NFSL has been backed by the CIA-MI6 since the 80's and had made multiple attempts to overthrow Qaddafi's government with both terrorist attacks and armed insurrection. 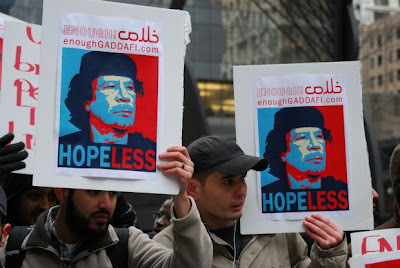 Photo: Please note the "EnoughGaddafi.com" signs. 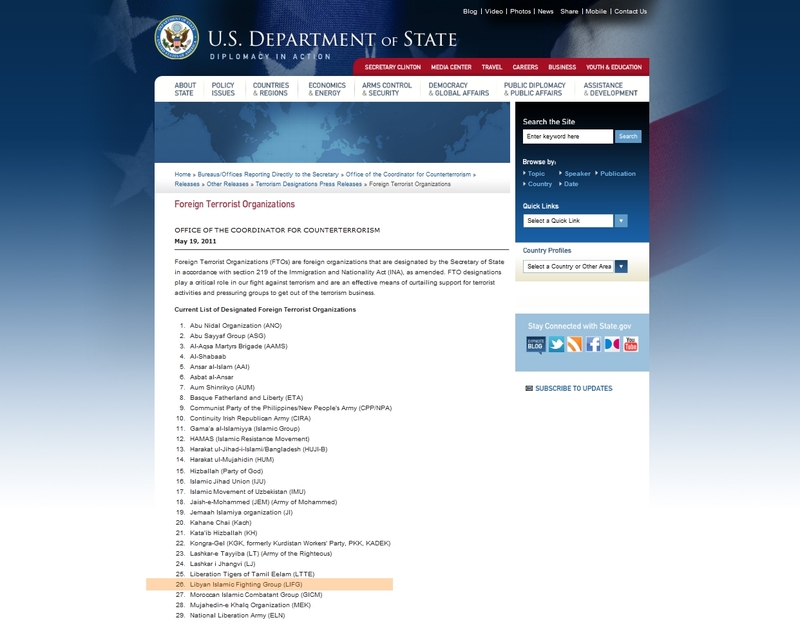 EnoughGaddafi.com's webmaster is listed on the US State Department's Movements.org as the "Twitter" to follow. February 18, 2011: In the wake of Honsi Mubarak's ousting, billionaire bankster George Soros' Open Society Institute was found to be behind NGOs drafting Egypt's new constitution. These "civil society" groups include the Arabic Network for Human Rights Information openly funded by George Soros' Open Society Institute and the Neo-Con lined NED funded Egyptian Organization for Human Rights. It appears that while the International Crisis Group was turning out the strategy, and their trustee ElBaradei leading the mobs into the streets, it is the vast array of NGOs their membership, including Soros, fund that were working out and implementing the details on the ground. February 21, 2011: An interview with Ibrahim Sahad of the National Front for the Salvation of Libya (NFSL) on ABC Australia, featured every talking point covered by the mainstream corporate media from previous weeks regarding Libya, all with the White House and Washington Monument looming over him in the background. He made calls for a no-fly zone in reaction to unsubstantiated accusations Qaddafi was strafing "unarmed protesters" with warplanes. March 2011's "US Libyan Policy: Zero Legitimacy," noted the clearly heavily armed, western-backed insurgency that was still being disingenuously portrayed by Western media as "peaceful protests." While Libyan opposition leader Ibrahim Sahad leads the rhetorical charge from Washington D.C., his National Front for the Salvation of Libya (NFSL) on the ground is armed to the teeth, as it has been throughout its 20 year history of attempted CIA backed rebellions against Qaddafi. In 1984, the NFSL tried to overthrow Qaddafi in a failed armed coup. The Daily Globe and Mail also recently confirmed that the NFSL along with the Libyan National Army, both under Sahad's new National Conference of Libyan Opposition (NCLO), had both "attempted coups and assassinations against Col. Gadhafi in the 1980s." March 17, 2011: The UN decided to enforce a no-fly zone over Libya to save the globalist-backed rebellion sputtering in failure and bordering on a "Bay of Pigs" disaster. Canadian, US, French, Arab, and UK jets were already reported to be preparing for the operation. March 24, 2011: Unrest had already begun in Syria, as NATO began bombing Libya while Egypt and Tunisia had already fallen into political and economic chaos. In "Globalists Hit in Syria," the opposition is closely examined and documented to be once again a creation of Western-backed opposition groups. Much of the "evidence" of Syria's unrest was being filtered through organizations such as the London-based Syrian Human-Rights Committee whose hearsay statements posted on its website were cited by corporate news media in outlandish reports of violence that also include "activists say" after each allegation. The "Syrian Observatory for Human Rights," also London-based, is now the exclusive source cited by corporate-media reports regarding Syria. March 26, 2011: In Egypt, signs of a counterrevolution and the first signs of weakness in ElBaradei's chances to be installed as president began to show. Mobs pelted ElBaradei with rocks calling him "an American agent." Wikileaks would again come to the aid of US interests and try to reintroduce the "anti-Western" image ElBaradei had been hamfisted in portraying. Photo: The "barrier of legitimacy" is broken: a mob shouts "American agent" as they hurl rocks at ElBaradei who most certainly is an American agent - a trustee of the US International Crisis Group alongside George Soros. March 28, 2011: Fortune-500 funded Brookings Institution's "Libya's Test of the New International Order" is reported on - exposing the war as not one of a "humanitarian" nature, but one aimed explicitly at establishing an international order and the primacy of international law. Image: Red = US-backed destabilization, Blue = US occupying/stationed. China's oil and sea access to the Middle East and Africa are being or have already been cut. A similar strategy of isolation was used on Japan just before the onset of World War II. April 17, 2011: Syria's unrest yields widespread arson as well as reports of gunmen targeting both protesters and state security forces in a bid to escalate violence. In, "Globalist War Machine Fixates on Syria," the "Libyan Precedent" is already being cited by US and French politicians as justification to use force against Syria. A later article, "Color Revolution's Mystery Gunmen," establishes a historical context within which to view the current violence in Syria and the fact that it is provocateurs sowing much of the violence. April 21, 2011: Belarus President Alexander Lukashenko announces that his nation is now also under covert attack by Western forces to foster an "Arab Spring-style" insurrection. In, "Besieging Belarus," documented ties between Belarus opposition members and the same Western organizations and institutions fueling the Arab Spring are illustrated. 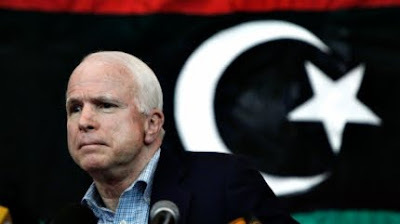 April 22, 2011: John McCain touches down in Benghazi, Libya and consorts with verified terrorists who were fresh back from Iraq and Afghanistan, killing US troops. A West Point report would later confirm (.pdf from West Point's CTC can be found here) with absolute certainty that the region from which the Libyan rebellion began was also the Libyan Islamic Fighting Group's (LIFG) center of operations. It would also expose the fact that LIFG were in fact long-time affiliates of Al Qaeda with LIFG members occupying the highest levels of leadership within the terrorist organization. May, 2011: In "Libya at Any Cost," the conflict in Libya was reported to be escalating, including NATO attempts to assassinate Qaddafi and the targeted killings of several of his family members including several of his grandchildren. "America's Arab Deception" attempted to review the past several months of engineered chaos blowing through Northern Africa and the Middle East, while it was noted in, "You Can't Make This Stuff Up," that the National Endowment for Democracy already began its first round of self-aggrandizing, and passing out awards to several of the dupes and collaborators that made its campaign of carnage throughout the Arab World a reality. June, 2011: In "Arab Spring brings Corporate Locust," the true agenda behind Egypt's, and indeed the entire "Arab Spring's" unrest became apparent as US representatives gave Fortune 500 executives a tour of destabilized Egypt and Tunisia in an effort to promote economic liberaliztion and privatization. 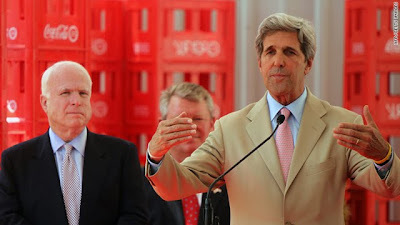 John McCain and John Kerry led the tour and had co-sponsored bills to promote what would essentially be the meshing of Egypt and Tunisia's economy into the Wall Street/London international order. Photo: McCain (left) and Kerry (right) gesticulate as they explain their paymaster's agenda within the confines of an Egyptian Coca-Cola factory. This is part of their latest trip surveying the effects of their US-funded opposition overthrowing Hosni Mubarak's government. 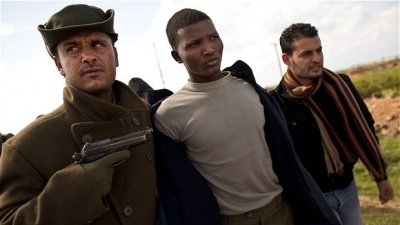 July, 2011: The African Union would wholly reject the International Criminal Court's mandate against Libya, exposing the severe illegitimacy with which it operates. Ties to corporate-financier funded organizations are revealed in "It's Official: International Criminal Court has ZERO Mandate," as well as the tenuous nature of the ICC's claims against Libya's Qaddafi. It would later be confirmed by members of Libya's "human rights" community that indeed they, in collaboration with the rebel leaders, fabricated the numbers supplied to both the UN and the ICC, and that no verified or documented evidence of Qaddafi's "atrocities" were produced. In Thailand, another long-running US-backed color revolution finally yielded results and saw the return of Wall Street proxy, Thaksin Shinawatra's political party to power. Various mouthpieces of the global elite, including the Council on Foreign Relations itself, gave stern warnings to Thailand's establishment to accept the tenuous results of the July election or face isolation and other consequences. Another Southeast Asian country, Malaysia would also see color revolution take to their streets - this time in Malaysia by the yellow-clad, NED-funded Bersih movement. 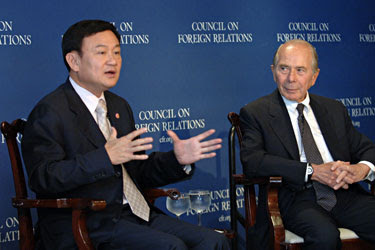 Photo: Thaksin Shinawatra, a long time servant of the global elite, since before even becoming Thailand's prime minister in 2001, reports to the CFR in New York City on the eve of the 2006 military coup that ousted him from power. He has now returned to power in Thailand via a proxy political party led by his own sister, Yingluck Shinawatra. Securing the votes of only 35% of eligible voters puts on full display how tenuous his support really is within a nation he claims stands entirely behind him. August, 2011: By August, even the corporate-media began admitting that Syria's opposition was "mostly unarmed," or in other words, armed. The opposition was starting to be more clearly defined as armed ethnic groups and armed militants of the Muslim Brotherhood. September, 2011: Sensing victory in Libya, corporate-financier funded think-tanks began preparing for the rebuilding and despoiling of the Libyan economy. In "Globalists to Rebuild Libya," NATO's Atlantic Council wrote a report detailing just how they would go about doing this. Also as Libya's violence spiraled out of control and atrocities carried out by the rebels and their NATO backers became more obscene, it became clear how fraudulent the "War on Terror" was. In "Libyan Rebels Listed by US State Department as Terrorists," it is illustrated how NATO members were guilty of anti-terrorist laws for providing material support for listed terrorist organizations. September also saw real humanitarian catastrophe unfold in Uganda, where a British corporation sanctioned genocide to clear land they had "leased" from the Ugandan government. Thus illustrates how the cause of "humanitarian concerns" is called on only when it serves Wall Street and London's interests, and otherwise ignored when it involves verifiable genocide carried out in the pursuit of furthering their wealth and power. Photo: Robert Devereux, a long time investor, a long time con-artist spinning his company's despoiling of Africa as some sort of cutting-edge investment strategy that makes money and "helps" people. Even as Devereux made his disingenuous statements in 2010 regarding New Forests, the villagers in Uganda he was "helping" had already filed a court case a year earlier protesting the British company's encroachment on their land. These villagers would be forcibly displaced, many of them killed by Ugandan troops acting on behalf of Devereux. John McCain would land once again in Libya, this time in Tripoli to celebrate the destruction of the country and shake hands once again with the Libyan Islamic Fighting Group that delivered Qaddafi's Libya into the hands of the Wall Street/London elite. 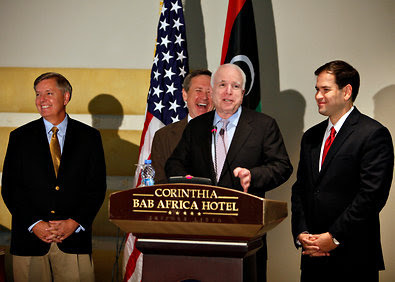 Photo: It's all smiles and laughs in Tripoli as McCain, a chief proponent and driving force behind the US intervention in Libya, literally glorifies Al Qaeda's exploits in the now ruined nation. Miles away, the very rebels he was praising are purposefully starving the civilian population of Sirte in an effort to break their will, while they and NATO indiscriminately use heavy weapons aimed at crowded city centers. Rhetoric for war with Iran had been steadily increasing and the beginning of what looked like a covert war was being fought inside and along Iran's borders. A disastrous ploy of framing Iran for the alleged planned assassination of a Saudi ambassador in Washington D.C. fell apart when Iranians linked the plot to US-backed terrorist organization Mujahedin-e Khalq (MEK). Image: MEK. Admittedly a terrorist organization, listed by the US State Department as being such, it is fully funded, armed, and backed by the United States, based in France and US-occupied Iraq, and allowed to conduct terrorist operations against the Iranian people. The "War on Terror" is a fraud. It is more than likely that the withdrawal of troops from Iraq would simply provide the US "plausible deniability" for an Israeli airstrike on Iran. 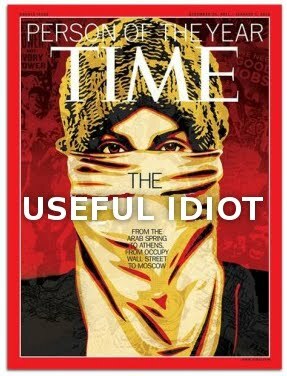 November 2011: Syria's "peaceful protesters" who had been all along fully armed and attempting to stoke a Libyan-style civil war, were finally acknowledge as such by the corporate-media and more importantly by the corporate-funded think-tanks that supply them with their talking points. In "IISS: Syria's Opposition is Armed," it is states that a report out of the International Institute for Strategic Studies by Senior Fellow for Regional Security at IISS-Middle East, Emile Hokayem openly admitted that Syria's opposition was armed and prepared to drag Syria's violence into even bloodier depths. Also in November, Wall Street and London's assault on Libya came full circle with the installation of Abdurrahim el-Keib as prime minister. El-Keib who spent decades in exile in the US, was formally employed by the Petroleum Institute, based in Abu Dhabi, UAE and sponsored by British Petroleum (BP), Shell, France's Total, the Japan Oil Development Company, and the Abu Dhabi National Oil Company. Photo: And so begins the farce that is Western "democracy." One corporate-fascist puppet Mahmoud Jibril , steps down, another, Abdurrahim el-Keib, takes his place. In reality, it is NATO-states and their corporate sponsors that now determine Libya's fate. Pictured above, el-Keib poses with Mustafa Abdul-Jalil, chairman of the unelected, NATO-backed "National Transitional Council." Joining el-Keib would be US-funded activist, Moncef Marzouki, named Tunisia's president. Marzouki's organization, the Tunisian League for Human Rights, was a US National Endowment for Democracy and George Soros Open Society-funded International Federation for Human Rights (FIDH) member organization. Marzouki, who spent two decades in exile in Paris, France, was also founder and head of the Arab Commission for Human Rights, a collaborating institution with the US NED World Movement for Democracy (WMD) including for a "Conference on Human Rights Activists in Exile" and a participant in the WMD "third assembly" alongside Marzouki's Tunisian League for Human Rights, sponsored by NED, Soros' Open Society, and USAID. Photo: US NED-funded activist leader Moncef Marzouki after spending two decades in Paris, helps foist the facade of "democracy" onto the Tunisian people. Of course, he, or someone of equal servitude to the West was going to become "President." In 1993 Noam Chomsky would concisely describe the work of NED as "an attempt to impose what is called democracy, meaning rule by the rich and the powerful, without interference by the mob but within the framework of formal electoral procedures." In other words, those fighting in the "Arab Spring" did so for gilded tyranny. In Egypt, in late November, a second "revolution" began unfolding on the streets. In reality it was the same Western-backed forces led by ElBaradei and the emerging Mamdouh Hamza, against Egyptian military forces that seemed to have gone back on whatever arrangements they made with the West after the fall of Mubarak. The UN, in another attempt to escalate foreign intervention in Syria, would release a UN Human Rights Council report regarding Syrian "crimes against humanity" which was actually co-authored by Karen Koning AbuZayd, a director of the US Washington-based corporate think-tank, Middle East Policy Council, that includes Exxon men, CIA agents, US military and government representatives, and even the president of the US-Qatar Business Council, which includes amongst its membership, AlJazeera, Chevron, Exxon, munitions manufacturer Raytheon (who supplied the opening salvos during NATO's operations against Libya), and Boeing. The report itself contained no verifiable evidence, but rather hearsay accounts recorded in Geneva by alleged "victims" "witnesses," and "defectors," put forth by "all interested persons and organizations." In other words, it was an open invitation for Syria's enemies to paint whatever image of the ruling government they pleased. December 2011: With Tunisia and Libya fully run by Western proxies, Egypt and Syria still mired in chaos, and with globalists calling for war on Iran, the "Arab Spring" was nearly complete. However, the "Arab Spring" was only the first leg of a grander strategy to encircle Russia and China. In December, the campaigns to move in on Russia and China would begin in earnest. Image: The "String of Pearls:" China's oil lifeline is to be cut by the destabilization and regimes changes being made throughout Africa and the Middle East. 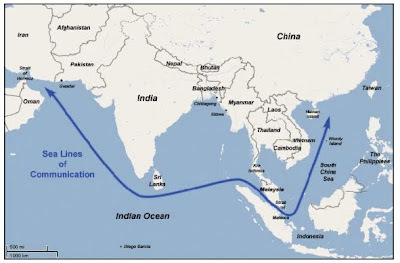 Along the "String" the US has been destabilizing nations from Pakistan to Myanmar, from Malaysia to Thailand, to disrupt and contain China's emergence as a regional power. "Upon reading Clinton's declaration of intent for American leadership into the next century, readers may recall the similarly named, ranting "Project for a New American Century" signed off on by some of America's most notorious Neo-Conservatives, which almost verbatim made the same case now made by Clinton. 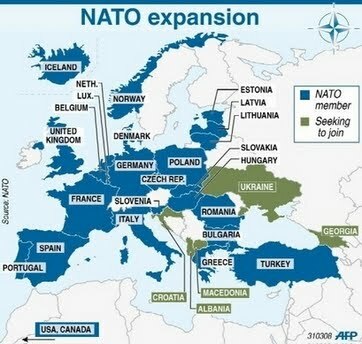 In fact, America's evolving confrontation with China, marked acutely by Obama's announcement of a permanent US military presence in Australia just this week, is torn directly from the pages of decades old blueprints drawn up by corporate-financier funded think-tanks that truly rule America and its destiny. For example, the recently reinstalled Wall Street proxy regime in Thailand led by Thaksin Shinawatra and his sister Yingluck, has received reassurances by Clinton herself just this week stating that, "it is in the national security and political interest of the United States to have this government succeed." As reported in-depth in "CONFIRMED: Thailand's "Pro-Democracy" Movement Working for US," Thaksin Shinawatra and his political regime have had long standing, well documented ties to Wall Street and London. The US backing of puppet-regimes like Thaksin, installing them into power, and keeping them there is central to projecting power throughout Asia and keeping China subordinate, or as Kagan put it in his 1997 report, these proxy regimes will have China "play Gulliver to Southeast Asia's Lilliputians, with the United States supplying the rope and stakes."" In Myanmar (Burma) "democracy icon" Aung San Suu Kyi, whose entire movement is a creation of Wall Street and London, received Hillary Clinton as well as Thailand's proxy-PM Yingluck Shinawatra in a globalist show of support designating her as the defacto leader and point of contact within the Southeast Asian country. Clinton's visit coincided with a successful campaign led by US NGOs to oust Chinese interests in the nation that resulted in the halting of a dam that was to provide electricity, revenue, flood control and irrigation for the people of Myanmar. Meanwhile in Russia, Wall Street and London attacked more directly, attempting to interfere with Russian elections in December and resulting in several street protests led by overtly linked NED, Soros, and Rothschild operatives. NED-funded NGO "Golos" played a key role in portraying the elections as "rigged" and constituted America's extraterritorial meddling in Russia's sovereign affairs. Image: NATO's creeping encirclement of Russia has now been combined with another round of "color revolution" destabilizations in Belarus and now in Russia itself. 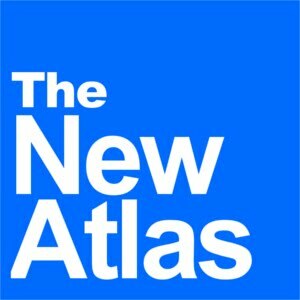 "It is quite clear that the National Endowment for Democracy, Freedom House, the Foreign Policy Initiative, and even the US State Department whose new foreign affairs advisory board is full of think-tanks representing overt corporate-financier interests, are not interested in "democracy," "human rights," or "freedom" in Russia, but rather removing the Kremlin out of the way, and reestablishing the parasitic feeding on the Russian people and its economy they enjoyed after the fall of the Soviet Union." In late December it would be confirmed that the same Al Qaeda militants that ravaged Libya with NATO's aid, were on their way to Syria to help overthrow the Assad government. LIFG leader Abdel Hakim Belhaj was confirmed to be on the Syrian border preparing troops of the so-called "Free Syrian Army." This wasn't the only recent example of the West operating in tandem with listed terrorist groups. It was also reported in, "EXPOSED: US Troops Guarded Terrorist Camp in Iraq," that the US has been guarding a terrorist Mujahedin-e Khalq training camp inside Iraq with US troops and is planning to relocated them, possibly in a freshly abandoned US military base in Iraq while D.C. lobbyists work feverishly to have them de-listed, armed, and sent to conduct terrorist operations in Iran. Shocking comments are made in the Brookings Institution's report, "Which Path to Persia?" where US policy experts conspire to use the terrorist organization against the government of Iran. In essence, corporate-funded policy makers have transformed the US into a state-sponsor of terror. The year 2011 was surely the year of the dupe. Youth enamored with lofty, naive notions of "freedom" sold to them by corporate-fascist funded NGOs were brought into the streets to create chaos and division which was then capitalized on by covert political and even military maneuvering by the West and its proxy forces. In Egypt the nation is teetering on the edge of being fully integrated into the Wall Street/London international order, while a big-oil representative is enjoying his new position as prime minister of Libya. In Tunisia a life-long stooge of Western machinations is now president, and an alarming campaign of NATO-backed violence and terrorism is gripping Syria. February's "The Middle East & then the World" is well worth reading again - to see how far we've come over the last year since it was written, and what is left for the globalists to do. As the globalists come ever closer to China and Russia's doorsteps the stakes will continue to rise and the placid spectating Americans and Europeans have enjoyed this year will forever be lost. Finally, consider what was written in one of the last articles of this year, "The End Game Approaches:"
"Complacency will kill, apathy is complicity: as the elitist-engineered "Arab Spring" reaches its conclusion, we stand on the precipice of being meshed into an inescapable, corporate-fascist, scientific planetary regime.... the End Game approaches. It is now "do or die" - unlike in the past, mankind now possesses the technology to render the vast majority of the population intellectually inferior through mass medication, food poisoning, GMO crops that rot our bodies and minds from the inside-out, and the martial means of eliminating vast swaths of the population permanently. Not only is this a possibility, it is a reality the global elite have conspired over at great length through texts like Ecoscience penned by current White House science adviser John Holdren and former White House science adviser Paul Ehrlich who openly talk about mass, involuntary medication to forcibly sterilize the population, reduce our numbers and confine us within what they literally call a "planetary regime." The End Game approaches." Let us not "hope" next year fairs better for free humanity. Let us with our two hands, our will, and our capable intellects ensure that it is better. The decision is not that of our "leaders" or "representatives," it is the decision of each and every one of us and what it is we do with our time, our money, our resources, our energy, and to where we pay our attention - each and every day. Let us define where it is we want our destiny to take us, and start taking one step at a time to get there. Let us wait no longer for "saviors," but rather look in the mirror and realize, God, the Universe, or whatever higher power you believe in, has already endowed you with everything you need, in your heart, your mind, and within your hands to prevail in whatever noble pursuit you, or "we the people" choose.